Permethrin is TOXIC to felines when wet. If you let cat near wet clothes it will kill your cat. For treating clothing/gear, you want a 0.5% solution. If you have a bottle of 10% permethrin,mix 6 3/4 oz of 10% permethrin in 1 gallon of water. This makes a 0.5% solution. Soak the clothing and then hang it up to dry out of the sun. If you have 36% permethrin, you will need to use 1 2/3 fl. oz. for each gallon of water to get a 0.5% ratio. excellent post - it helps a bunch - not worrying about conversions can have unplanned results and posting here really simplifies it. Gracias. We also treat our hammocks at the same time as our clothing. Any leftovers can be sprayed around the exterior windows, doors, and patios to provide insect protection, but like Tom states be careful around your cats and keep it out of the water supply. Any of you ever had a problem with odor? I have never used it,but I was telling my boss about it and she had some family member tell her they did it and it ruined their clothes or something like that. I told her they probably had the wrong concentration, but I referred her to this post. It smells a bit sweet, not unpleasant at all, and that goes away after a couple weeks. I picked this up at Walmart. My understanding is I do NOT need to dilute it, but this is for spray applications. Can anyone link me to a permethrin that is dilutable for dipping gear in? When I was googling around about this stuff a month or two ago I ran into some posts (I think on BPL) that claimed the stuff for clothes (like the Sawyer stuff above) works better for clothes because it is formulated with other chemicals that will help the permethrin cling to the cloth. Presumably the inexpensive stuff one normally uses for killing bugs around the house and garden won't work as effectively, not because the permethrin is different, but because it won't stay on the cloth. I'm just repeating what I found. I don't know if it is accurate. Makes sense. The instructions say 3oz per article of clothing. It says even saturation is not as important as having at least the recommended 3oz because with 3oz the amount of permethrin molecules will yield satisfactory results. Sarge, I went to tractor supply the other day and all the permethrin I found had petroleum distillates and I was told that is what gives off the fumes. Maybe I didn't look hard enough who knows? I've been using the spray permethrin from Tractor Supply for close to five years ago. It has a smell that is not unpleasant and goes away after a couple of days. Its designed to be used in stalls and on tack. Flynguy521 wrote: I picked this up at Walmart. My understanding is I do NOT need to dilute it, but this is for spray applications. Can anyone link me to a permethrin that is dilutable for dipping gear in? I don't have a link, but I think Sawyer also makes a dip version, or they used to. 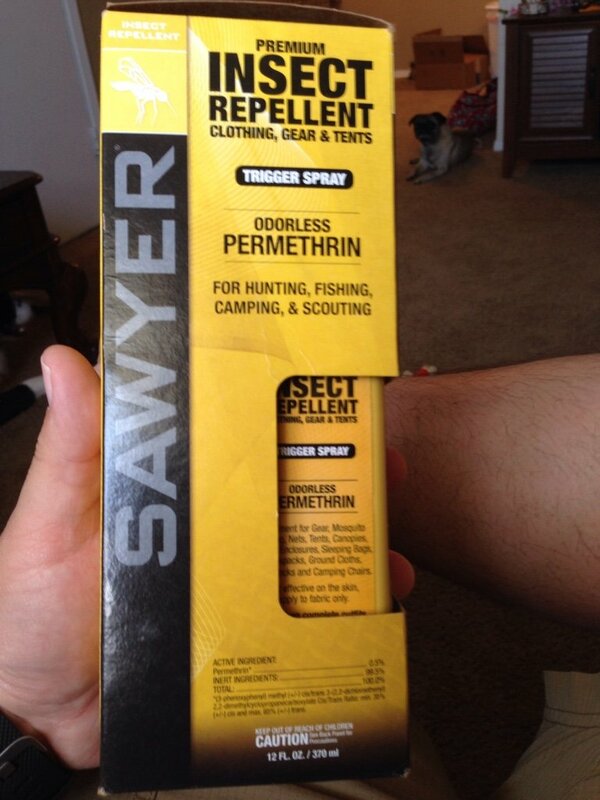 I have used the Sawyer spray from the beginning, never any smell or oil spots. I have experimented from time to time with various dilutions of stuff from the farm store, but have had a bit of both, I guess from the petroleum distillates. But I think the slight smell went away after a few days and or came out(with the oily spot) with washing.